Needed something to quiet and satisfy the craving within. What do you know? Bobby Flay came to my rescue. Stumbled on one of his Brunch shows. One of the items on the menu was fried red tomatoes. Decided to create my version as I had the main ingredients on hand (red plum tomatoes). Sliced them up about an inch, sprinkled a pinch of salt for flavor as well to draw the excess fluid. These were then placed on a sheet of paper towel in order to absorb fluid. Made an egg wash consisting of egg/milk/dollop of sour cream. This was seasoned with a pinch of salt. Also, did a mix of cornmeal/flour/cheddar cheese/squeeze of honey/pinch of salt/black pepper. Placed tomatoes in egg wash for a few minutes. Then in cheesy cornmeal mix. These were then fried in a combination of hot canola and olive oil on both sides until they were crispy. Served red fried tomatoes with an avocado dip. 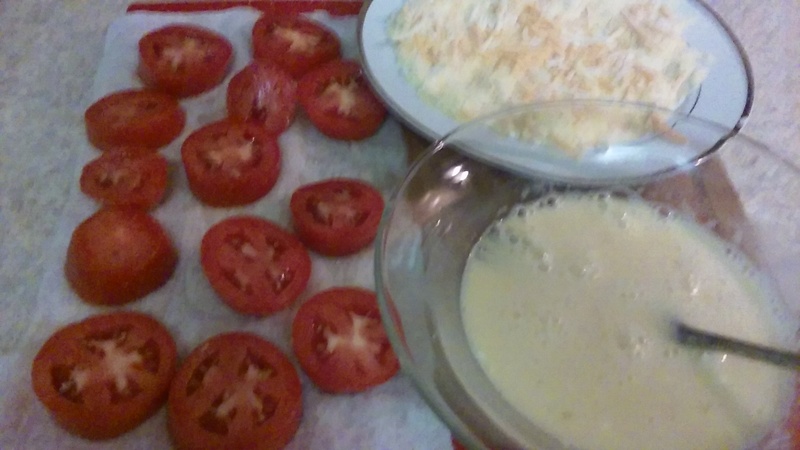 Oh, my red fried tomatoes were crispy and mouth-watering; just what my taste buds needed. Thank you, Bobby Flay. BEEF? WHAT BEEF? #TURKEY CHILI!